As Valentine’s Day quickly approaches, many are rushing to make reservations at a nearby restaurant or plans for the big night. However, if you’re not one of the 110 million people who are going out for a meal this Valentine’s Day, try celebrating this holiday with your special someone right inside your apartment! Below, we’ve outlined three key tips to getting the most out of your Valentine’s Day without ever leaving home. Just because you’re spending Valentine’s Day at home this year doesn’t mean that all sentimentality and romance should be thrown out; instead, work extra hard to make your apartment feel aptly special to spend a romantic night in. “Using a light switch dimmer and/or candles to light the dining area is another good idea to set the mood,” suggests Apartment Ratings. 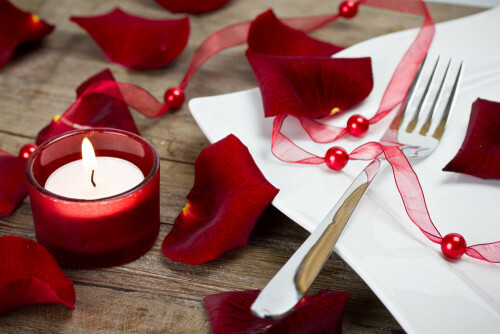 “Ideal, ambient lighting is a key to setting the mood for Valentine’s Day,” says one blog, and many will opt for candles. However, be mindful that if you do choose to use candles to set the mood, you should remember to blow them out before you leave a room. Flameless candles can be a nice alternative to add ambient line without requiring an open flame. De-clutter your apartment and minimize distractions to help create an ambiance inside your home that perfectly suits a night for two. Turn off the TV and put away phones and laptops to ensure that you’re taking the time to appreciate one another. “Having a clean, clutter-free apartment for your date can demonstrate to your partner that you care enough to take the time to clean and it can also echo a dinner at a posh restaurant,” said Apartment Ratings. The more effort you put into making the night special, the more romantic, extravagant, and special it will seem. By paying close attention to details, including tablecloths, flatware, utensils, and more, you can create the illusion of a date-like experience in the comfort of your own home. Even if the main course is simply takeout, use nice silverware and wine glasses to ensure your partner knows that you value the time you’re spending with them on this occasion. Don’t forget desserts! Fruit dipped in chocolate is a great dish the two of you can share together. There are all kinds of ways to get creative when decorating for V-Day; DIY decorations allow you to get hands-on with your decor without spending a lot of money. Work on a project together with your partner so you can create an elegant Valentine’s Day ambiance without leaving your apartment. Keep checking back for more tips and tricks on how to make the most of your apartment home. And if you’re interested in becoming a resident at a Lincoln community, please contact us today.